Prosperite is one of the top barges in France. 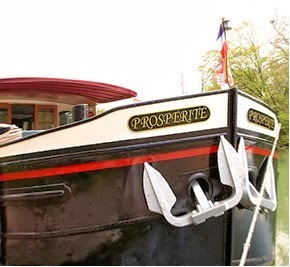 In 2003, Prosperite was created by an American hotelier and represents a successful new approach to barge cruising. Original ideas such as the demonstration kitchen and the “open refrigerator” with drinks, snacks and desserts available 24 hours a day, reflect modern living and entertaining. Time seems to stand still as Prosperite slowly motors by quaint stone churches and well-kept houses, periodically pausing at moss-covered locks, as it makes its leisurely way from one town to the next. Catch up on your reading on deck, enjoy a delicious, gourmet meal from your private chef’s kitchen, and simply relax to the gentle sounds of water lapping against the hull. Enjoy the quite sensation that comes with unplugging yourself from the world on a luxury barge cruise. This cruise is ideal for the person who wants to escape to a quite and peaceful deck, slowly winding through the French countryside. During the seven days and six nights, the 128-foot long Properite will serve as your floating home away from home. She is designed and constructed to meet the expectations of upscale travelers desiring to experience the luxury of five-start travel, where no expense has been spared. Our goal is to provide guests with the ultimate in luxury and accommodations while they travel with us. A Prosperite cruise offerssome of the largest rooms and highest level of amenities you will find on any of the barges in France. Enjoy the space and comfort of luxury accommodations; you truly won’t want to return home after a week in one of our staterooms. If you’re feeling more adventurous, the Prosperite barge cruise features daily excursions in our accompanying Mercedes bus into the surrounding countryside. You will explore the local chateaux or sip the fruits of one of the many local vineyards. Whether your goal is to unwind on the decks and enjoy the scenery, or get out and experience the surroundings first hand, we have something for you! To learn more, please visit the France Cruises website at http://francecruises.com/~francecr/barge-46-Prosperite-190.html, or call U.S. toll-free 1-866-498-3920.